The anticipation was high as we started our drive to catch the 9 a.m. ferry to Vancouver. 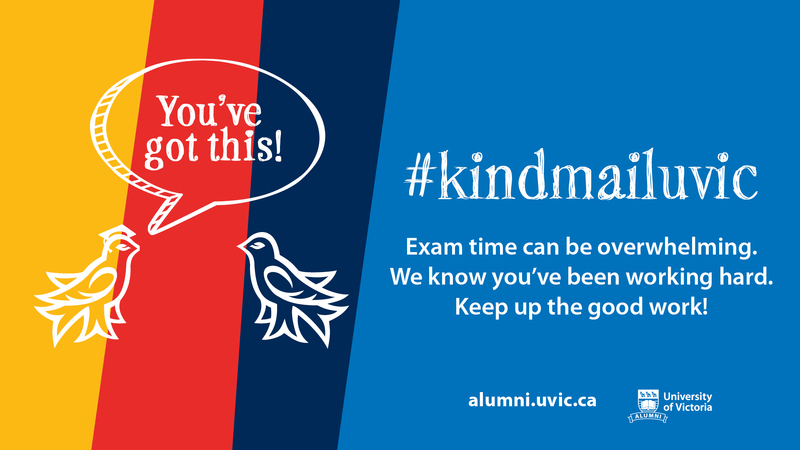 The Allman Brothers played in the tape deck of Dirk Slot’s Volkswagen as he described the nitty-gritty of beer making and why UVic Brew was going all the way to Vancouver to brew 2 000 litres of beer. I could hear the excitement in his voice as he described the grain bill (beer ingredients) and how temperature plays a big role in flavor profile. It was no surprise that someone like Slot, a chemistry student, was the president of UVic Brew. As we arrived at the ferry terminal and made our way to our seats, I knew my lesson in beer had just begun. Slot briefed me on what I would see after arriving, and expected me to get my hands dirty to help in the brewing process. He told me how UVic Brew started in 2011 as a beer-critiquing club, but by the end of his first year, the club had brewed 30 litres of beer with many beginning brewers. Since then, the club has tripled its output to well over 100 litres. When Dirk mentioned why we were in Vancouver, we could already see Grouse Mountain through the window. He had a huge smile on his face when he told me that UVic Brew was discovered by UBC and SFU’s brewing clubs and was invited to compete in the Hops Connect Cup II, a university beer-making competition. There were five categories, and each university could submit three entries to each category. UVic Brew submitted 12 entries, which was a challenging feat, as each entry was a required 23 litres. For all that hard work, UVic won Best of Show with a porter named Freyja Brau. Duncan Blackman, who also owns Happy Homebrewer in Langford, made the winning recipe. With this prize came an invitation from Deep Cove Brewers and Distillers in Vancouver to produce a 2000-litre commercial batch of Freyja Brau. It was at this point in the story that we arrived at the brewery and were greeted by two smiling guys in overalls. 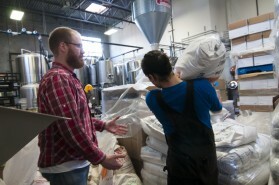 They were Kevin Emms, the brewmaster, and Evan Cronshaw, listed as “porridge shoveler” on their website (and another brewer on the Deep Cove team). We were immediately put to work among the tanks and bags of grain, starting with milling the grain. 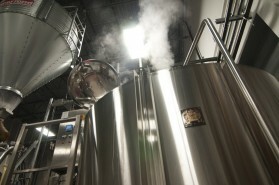 The next step was preparing the mash and choosing the temperature to convert the starches to sugar at the proper rate. Once the mash was done, it was transferred to the boil tank for ‘sparging’, a rinse of the grain bed with water to get the converted sugars out of the mash. At this point, there were preparations for the 90-minute boil, and the hops were added at different intervals, which caused the whole brewery to smell like hops. After all of this, the product was sent through a heat exchanger to chill, and the wort was oxygenated before going to the final stage in the fermenter. There it will stay until it is ready for bottling and release. The release party is tentatively set for Mar. 7 at the Hop & Vine Pub (1601 Burnwood Dr #9, Burnaby, B.C.). Freyja Brau will also be sold in Victoria at Spinnakers Brew Pub. 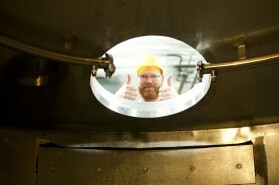 Dirk Slot, the president of UVic Brew loves beer. 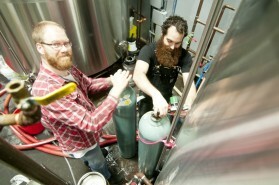 Dirk Slot (left) and Evan Cronshaw (right) haul oxygen tanks used to oxygenate wort.